There are options for communication to the Central Station other than a conventional telephone line. One of these cellular options is called Uplink and is the one I supply when this is the preferred method of communication to the Central Station, or, more often, simply needed as a backup to a conventional telephone line. I am often asked..."What happens if the thief cuts the phone line ?". The answer is, the horn will go off as per normal, but the alarm panel cannot contact the Central Station to report the break in. At this point, the alarm system owner is depending solely upon the horn to scare the thieves away. In many cases it will, especially with young thieves; however, the home remains wide open to others until it is secured properly. Is this a major problem in Ottawa at this time? No, it isn't, but this is not to say that one day thieves won't become wise to this and realize how easy it is to defeat a conventional alarm system by cutting the phone lines. Is this a problem in the larger metro centres like Toronto and Montreal ? The answer is, it is a growing problem, albeit still not a very common occurrence in residential robberies. This is because most residential burglaries are "crimes of convenience or opportunity". Thieves don't plan to enter a specific home; they just seize upon an immediate opportunity to do so. Most just ring the front doorbell, and when no one answers, they simply kick in the front door !!! So little or no planning is involved ! The presence of good physical security and an alarm system is usually enough to send them over to your neighbour's home, where they know that they can find all the same things in that home as in yours, but with little risk or difficulty in entering. However, the opposite is true with commercial robberies where thieves are often somewhat more knowledgeable in such matters. There the risk of loss of contents far exceeds the extra costs of cellular backup and can be a cost effective solution to telephone line cut by professional thieves. Uplink 4550 is available for $215 and operates on 2G,3G and 4G networks. 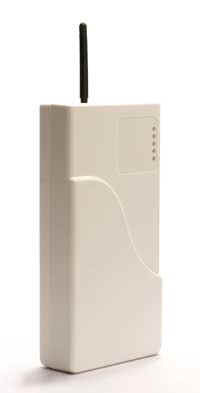 It sends the full complement of signals from your panel and does not differ from alarm transmission over a phone line. The Uplink 4550 is a cost-effective solution for full event reporting, that can be used as a primary wireless alarm communicator. It offers dial-capture, one output and trouble reporting for universal compatibility with almost every alarm system and central station. The Uplink 4550 communicates to Central Stations in Contact ID or SIA formats by dial-up to any industry standard receiver - all with the exceptional service and features you’ve come to expect from Uplink. The UPLINK Universal Alarm Transceiver is a cellular unit designed to signal the central monitoring station even if telephone lines have been cut or damaged. As wire line vandalism increases, providing reliable secured monitoring is critical to customer satisfaction. The Uplink units typically transmit alarms in less than one second, versus the four to five seconds it takes for a phone line to dial the central station, dramatically reducing the time a professional thief has to disable an alarm panel. This feature becomes even more significant in a fire emergency, when every second counts. Uplink's alarm acknowledgement feature guards against alarms ever being "lost", as can happen with systems dependent on two-way radio, since Uplink continues to send an alarm until it is acknowledged by the network. The Cellemetry® Network is a fully redundant system, operating 24 hours a day, 365 days a year, providing the best performance possible, allowing the industry to provide customers the confidence that their security is never compromised. The field unit can be tested on a weekly basis, to ensure that Uplink is fully functional at all times.